We’re hoping that all children and adults interested in learning piano or any instrument are ready to bring a goal and a vision to their Piano Lessons. Teachers love working with students who know what they want to accomplish and are willing to work hard. Personally, I like to give my students a list of options to fill out what they want to improve in the coming year of piano lessons. They have to choose at least 2 but not more than four targets, to make the goal attainable. Read my list below and think to yourself what you would like to accomplish this year! 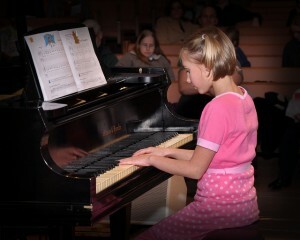 Knowing what you want to accomplish and communicating this with your teacher will be your key to success in piano lessons! You have the perfect opportunity now, with a new school year coming, to make goals and plans and discuss with your teacher at your first lesson. Whether you’re learning piano, drums, guitar, violin – each student will benefit from setting a vision for their year of music study. Learning and mastering an instrument is one of the most rewarding accomplishments in life and certainly something that will always remain with you. Experience success this year by thinking ahead and then going out to accomplish your plan! Is this the year you take piano lessons? So, as I sit and listen to my little one, pounding painfully away on the black and whites, all I have to do is remember that as she continues to practice, she’ll be creating a great deal more than a few simple melodies, which is truly music to my ears.